provides instruction in key areas of Fitness, in weekly sessions over a 4 week period. This activity requires a minimum of 1.5 to 2.5 hrs. of training time per session. Provides instruction in one topic area, with a Drill Play Adventure practical. Activity requires a minimum of 5 hrs. of training time. Provides instruction in two topic areas, with a Drill Play Adventure practical in both topic areas. Activity requires a minimum of 7 hrs. of training time. Provides instruction in all four topic areas, with a Drill Play Challenge practical in all four topic areas. May include evening cultural activities, and morning fitness sessions with Team Runs. This activity requires a minimum of 14 hrs. of training time. of the combined skills in all four PATH FINDER topic areas. 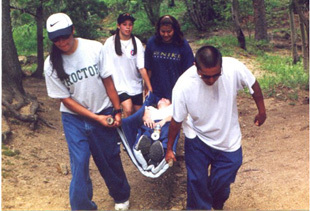 PATH FINDER training activities. This activity requires a minimum of 40 hrs. of training time.